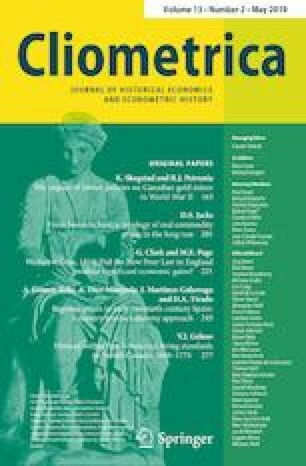 Welfare reform, 1834: Did the New Poor Law in England produce significant economic gains? Because of the intense public debate about reforming the poor law, the English collected a great deal of information about poor payments, population and occupations by parish in the years 1825–1842. For the tests outlined above, we measure farmland rents in 1842 from the tax valuations for this year of all farmland in a parish (Great Britain, Parliamentary Papers, 1845). For properties let within 7 years of the assessment (i.e., 1835–1842), the rental value was the contracted value. For properties on longer leases, it was the assessed market value. Thus the parish land rents measured in 1842 all stem from the post-reform period. We added any tithe payments (also recorded in this source) to the rents, so that the 1842 measure is for all rental claims on farmland in the parish. Only parishes with more than two-thirds of the property value coming from land in 1842 were included so that we are dealing mainly with rural parishes. To get the rent per acre in 1842, we divide by the land area of the parish. Since not all of this parish area was farmland, it introduces an error in this measurement, which fortunately is on the left-hand side of our estimation of Eq. (4). In some rural parishes, a large part of the land was not used for agriculture, being too hilly. For rural parishes, the fraction of the area that was actually farmland will correlate with the population density. So we include population density as a control for this measurement error when estimating Eq. (4). In Table 3, the estimated coefficient on population density is positive, which is what we would expect from the nature of the measurement error. There is no parish-level data available on land rents before the 1834 reform. To get rental values in the years before the reform, we use data collected by Clark on newly formed rents (and tithes) on individual plots within parishes in the years 1820–1834.29 From these, we estimate parish rental values per acre before the reform by adjusting for plot sizes. Rents per acre tended to be much higher on smaller plots. We adjust land rents to the average plot size that would be expected for a parish of that character (based on population density, location, and type of agriculture). In 1820–1834, overall farm rents stayed constant (Clark, 2002) but in estimating pre-reform parish rents we included year dummies to control for such year effects. From 5739 plot rentals, we estimate 2207 rural average parish land rents per acre. Note that the intercept is greater than 0, and the coefficient on the 1842 rent less than 1. This implies, as we indicate above, significant errors in the later measures of rent per acre at the parish level. Data are available from the Parliamentary Papers on poor rate collections in each of the years 1824–1833, and 1838–1841 (Great Britain, Parliamentary Papers, 1830-1, 1835, 1844). We average these into poor rate collections in 1824–1828, 1829–1833, and 1838–1841, and so calculate poor rate payments per head, and poor rate payments per acre based on the 1831 and 1841 population totals. We calculate poor payments charged on farmland by multiplying these parish totals by the share of the parish property value in 1842 that was land. We calculate poor payments per acre by dividing the totals for the parish by the measured land area of the parish. This would introduce a measurement error which would bias the estimate of b toward 0, except that we are effectively normalizing on the left-hand side of Eq. (4) with the same imperfect measure of farmland area. We measure the fraction of land which was common property in 1842 using parish-level data on common land from Tate and Turner (1978). The fraction of common on the plots earlier is estimated as discussed in Clark (2002). The 1831 census supplies information for each parish on the population, the number of resident farmers hiring labor, the number of resident farmers not hiring labor, and the numbers of agricultural laborers (Great Britain, Parliamentary Papers 1833). We can thus identify rural parishes where most employment in 1831 was in agriculture. We kept in the sample only parishes where agriculture was the listed occupation for at least 50% of adult males in 1831.